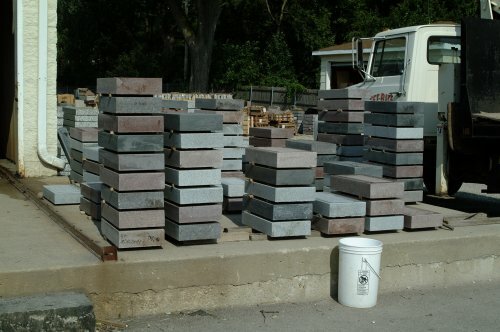 We restock our extensive granite inventory on a daily basis. In this picture, our plant employees are unloading blank pieces of stock that will be designed and lettered at our Hillside manufacturing plant. 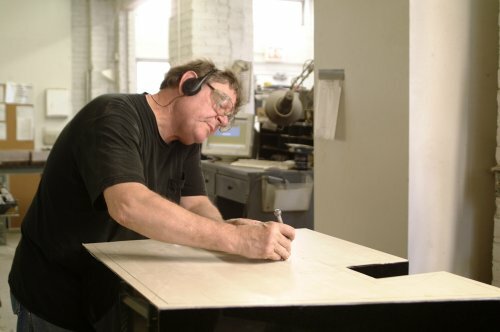 Gene Gray, a Troost employee of over forty years, is creating a hand-drawn custom monument design per the customer's specifications. 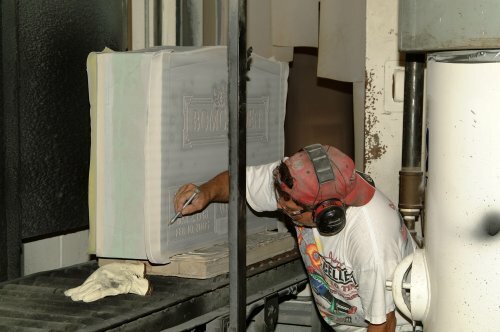 After the stencil is applied to the surface of the granite, the design process begins by exposing certain areas of polished stone to sandblast in preparation for ornamentation and lettering. 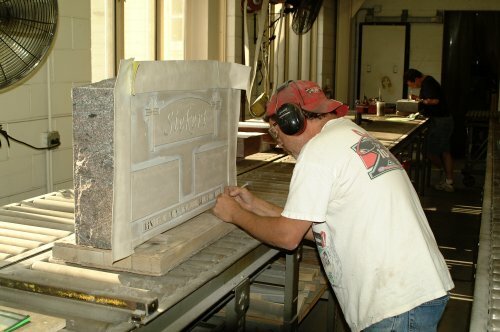 A careful inspection of the stencil for accuracy of spelling and layout precedes the placement of the stencil on the stone. 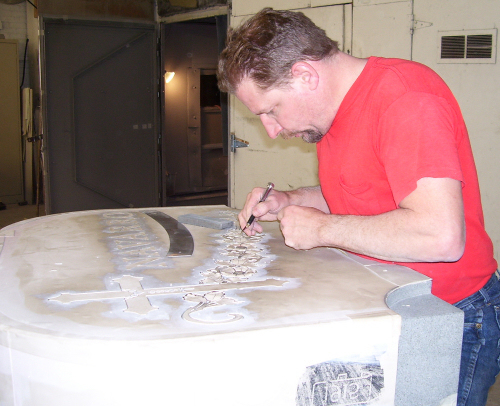 A rubberized stencil is created for each memorial. It is then affixed to the granite with a special adhesive. Specific areas of the stencil are then removed to create a space for inscriptions and artwork. 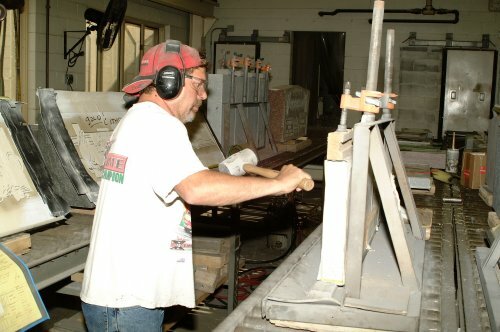 The marker will then be ready for the first step in the sandblast process. 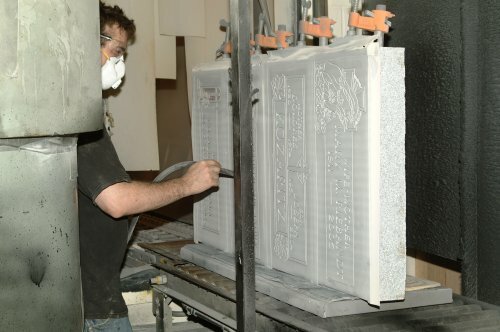 A rubber mallet is used to tightly secure the stencil to the stone before it enters the sandblast. This is a staging area for markers and monuments after the initial sandblast. 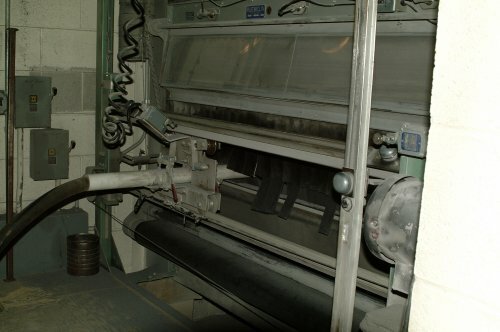 After they have been inspected for accuracy, these Lawn level markers are moved on the conveyor belt to the final sandblast area. 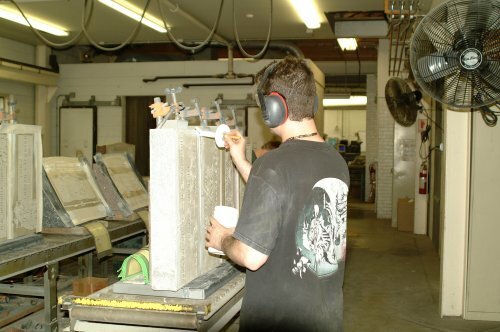 Adhesive and rubber are applied to the stone to protect any exposed surfaces during the blast process. 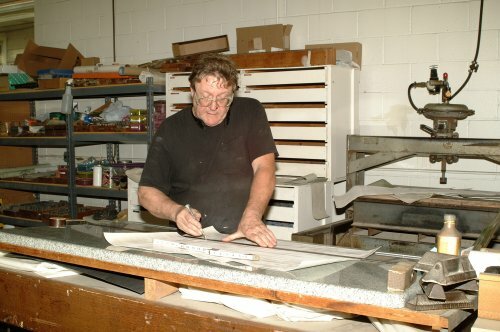 John Hendrey, a Peter Troost Employee for over 25 years, hand-sculpts roses on a monument. 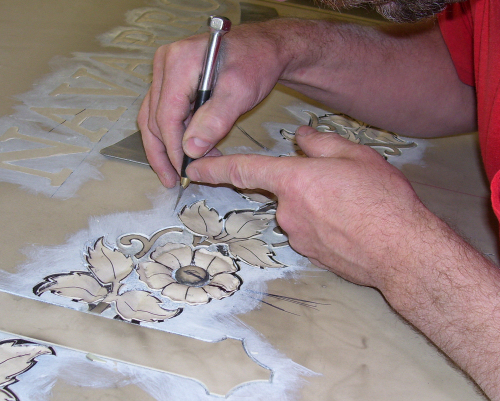 A visual inspection of the stencil prior to sandblast is done to insure quality at every step. 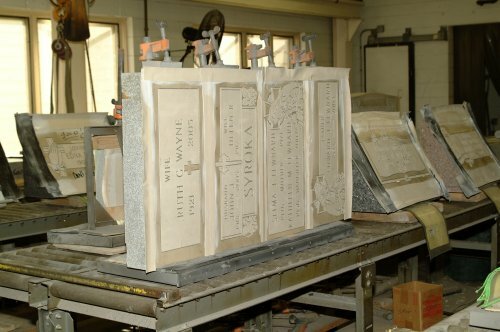 An automatic sandblast machine produces a uniform depth of blast to create the memorial. During the blast process, a visual inspection monitors depth and consistency of lettering and design. 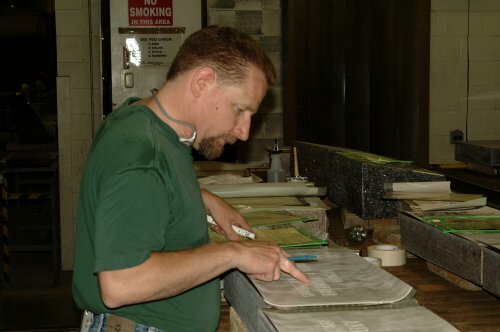 After the final sandblast process is complete, Jeffrey Hammond is preparing markers for the application of a darkening agent which highlights letters and designs. 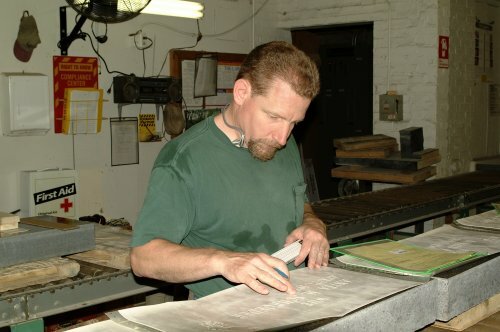 During the final process of manufacturing, the stencil that was used to create the design and the lettering must be removed. This Troost employee, Jose Pacheco, will then clean the stone to remove the adhesive that kept the stencil in place during the sandblast. 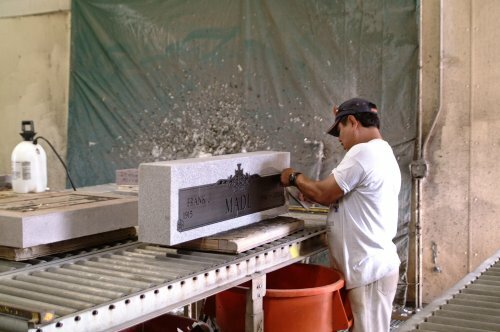 Certain styles of lettering and design require hand-chiseling and texturing to enhance the finished memorial. 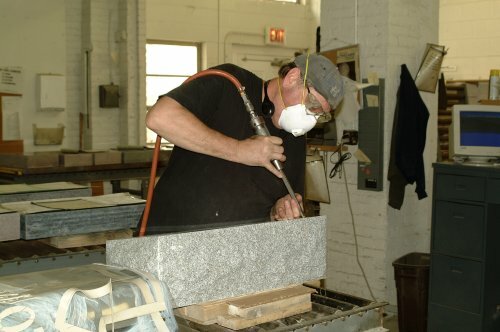 This process replicates procedures that have been utilized in the granite industry for years. These finished markers are on our loading dock awaiting delivery to the various local cemeteries.